If you have been doing this for a while, I am sure you have felt like everything gets dumped at your doorstep with little or no understanding to what it is we do. Most days I am met in the hallway being asked by a teacher to listen to a child with articulation errors and the teachers cannot understand the student. Speech kid. Easy, right? Absolutely those children need to be identified, however, what can be frustrating is missing the students they do not ask me to observe, or the ones, I feel, are often overlooked. Our Language kids. Why do our classroom teachers, whose classes are often rich in language miss these students? I believe it is because they do not understand what it is we do sometimes, and often they do not realize the development of language or the difference between speech versus language. At the beginning of the school year I always try to hand out a packet to my teachers to show signs of what to look for in a child with a speech and language delay. This packet, although useful, often gets scattered in the hustle and bustle of the new school year. It is not until later they realize a child may have a language delay. Typically, we get caught up in testing and annual reviews and often times, are not available for these types of valuable opportunities. What can we do? How do we explain it? 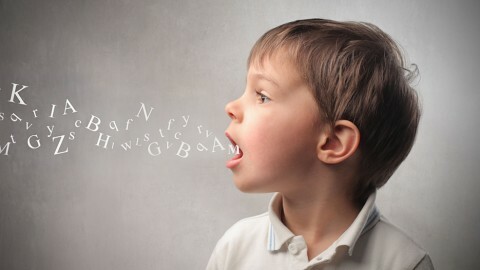 We have to make them understand the following: Speech is the complex motor system that coordinates breathing, voicing, and articulation to transmit language fluently. This is what teachers readily identify as a “speech kid”. What they are missing is that language piece. Language is the symbolic system for encoding meaning which includes vocabulary, syntax, morphology, and pragmatics. It is discrete and infinite. Language is what leads us to communication, exchanging ideas and information. Children will often follow a routine in the classroom without having that language to describe or tell what they are doing. These children are often overlooked. Fluency with a checklist of questions for the teacher to ask. So far, the responses have been good. We have been able to address some students that might have otherwise been overlooked, as well as begin interventions within the SST process to address some of the concerns. Teachers seem pleased and pleasantly surprised as to what they were not understanding about what we, as SLPs do. It’s a little thing, but I think, for my teachers, it is the beginning of a beautiful understanding!